Rear Admiral Husband Edward Kimmel, USN, (1882-1968) Commander, Cruiser Division Seven (COMCRUDIV 7), photographed circa 1939, probably on board his flagship, USS San Francisco (CA-38). Husband E. Kimmel was born in Henderson, Kentucky, on February 26, 1882 and graduated from the U.S. Naval Academy in 1904. Before reaching flag rank, he served in several battleships, commanded two destroyer divisions, a destroyer squadron and USS New York (BB-34). He also held a number of important positions on flag staffs and in the Navy Department, and completed the senior course at the Naval War College. After promotion to Rear Admiral in 1937, he commanded Cruiser Division Seven on a diplomatic cruise to South America and then became Commander Cruisers, Battle Force in 1939. In February 1941 he became Commander in Chief, U.S. Fleet and Pacific Fleet, with the temporary rank of Admiral. Operating from the advanced base at Pearl Harbor, Kimmel led his fleet during the months of vigorous training that preceded the outbreak of the Pacific War. 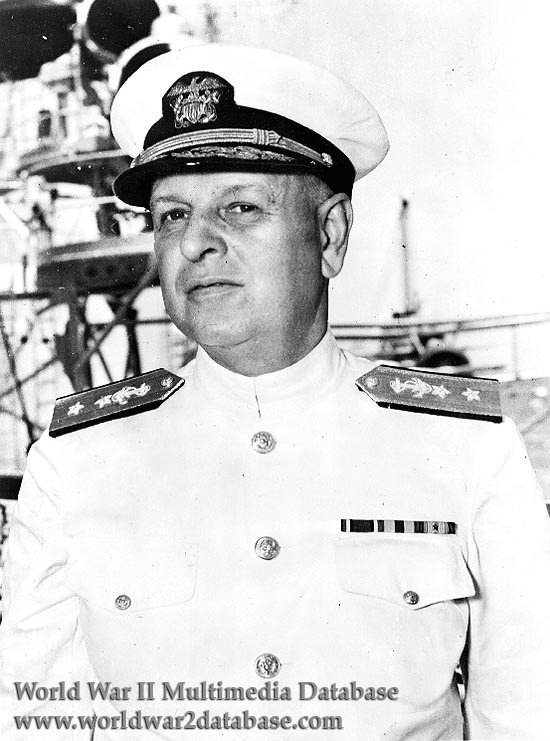 Relieved of his fleet command in mid-December 1941, following the the Japanese surprise attack on Pearl Harbor, Kimmel reverted to the rank of Rear Admiral and retired in March 1942. During World War II he supervised the construction and implementation of floating drydocks, providing forward bases with increased repair facilities with little preparation. Rear Admiral Kimmel died at Groton, Connecticut, on May 14, 1968. On May 25, 1999, the United States Senate passed a resolution exonerating Kimmel for not being prepared for the Pearl Harbor attack.